Superstrength formula removes stubborn limescale buildups. 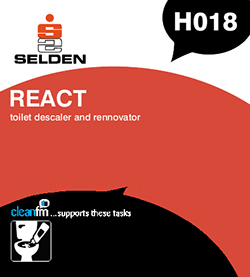 Ideal for hard water areas and rennovating older toilets. Kills odours at source - leaves a fresh bouquet fragrance. For ceramic toilets and urinals. Apply evenly under the toilet rim. Give up to 15 minutes contact time before brushing and finally flushing the toilet. For soil removal and descaling of large areas, REACT may be diluted with up to 4 parts water for brush application. N.B. Do not use on or near enamel, chrome, stainless steel, marble, terrazzo, stone, linoleum or plastic floors etc. Composition A perfumed blend of hydrochloric acid, cationic and nonionic surfactants.